Many parents are shocked to know that tooth decay can begin in their baby’s teeth. It can begin as soon as your baby’s teeth pop through the gums, typically by the age of six months. 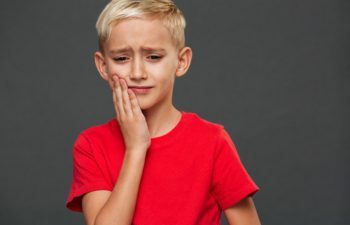 What makes this doubly difficult is the fact that your baby can’t communicate with words what pain they might be suffering related to the tooth pain they may be experiencing. The decay in your baby’s mouth cannot only cause pain, but it can also cause an infection to spread. This infection can eventually destroy your baby’s teeth and affect their general health. Over time, the decay can develop and a cavity can form. This tooth decay in baby teeth of young children is also called “early childhood caries.” Caries is simply another word for cavity. Cavities form when your child’s teeth come into contact with sugary foods and drink often and for extended periods of time. Common drinks that can cause tooth decay in children include fruit juices, sodas and other drinks with sugar. Your baby’s teeth are important. They hold the space in the jaw for the adult teeth. If your baby loses a tooth too early, the teeth beside it could drift into the empty space. This drifting of teeth can cause lack of space for the adult teeth to emerge. At Georgia Orthodontics & Children’s Dentistry, we recommend that your baby come in for its first dental exam before 12 months to ensure that they are on the right path to a beautiful and healthy smile!